The Shanghai Wild Animal Park has announced that two of their pandas have passed away. On December 19 mother panda Guo Guo became sick, and unfortunately, so too did her baby Hua Sheng (nicknamed Peanut), which was the first giant panda born in Shanghai, this year. 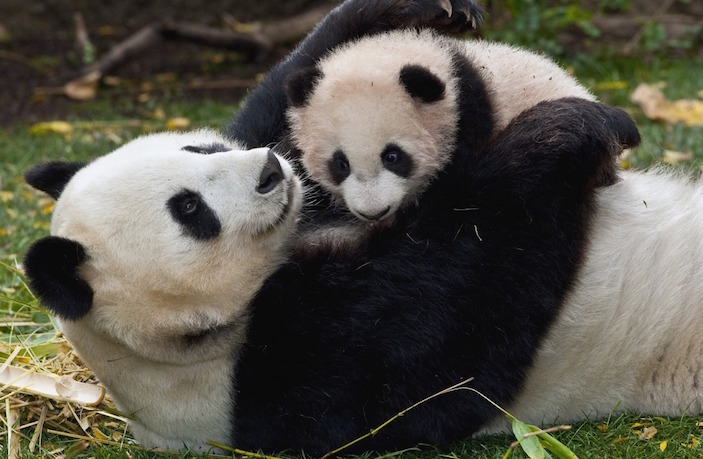 Vets from the Chinese National Panda Care Center diagnosed them with fever, diarrhea and other clinical symptoms and prescribed treatment, but their conditions worsened, and eventually resulted in the mother and child's death. Guo Guo passed away on December 26 at the age of 21. Lab exams revealed the death was due to acute pancreatitis. Baby Hua Sheng, was switched to artificial milk when her mom became ill, but only a few days later she was found vomiting and with cramps. She was diagnosed with a twisted intestine, and although she was put under surgery, her condition didn't improve. She passed away at just 175 days old. An announcement about the pandas death hadn't been issued earlier as the park was trying to carry out a pathological analysis wtih the conservation center. The bodies have been frozen and preserved and samples have been sent to scientific reserach institutions for analysis to prevent these types of tragedies in the future. The park now has five giant pandas. Two people have been placed under 'coercive measures' after three pedestrians were killed by a falling signboard on Nanjing Dong Lu. A woman died after falling from one of the terminal buildings at Shanghai's Pudong International Airport. Three people have been killed and six others injured after a souvenir shop's signboard collapsed on Nanjing Dong Lu. The legendary Australian stand-up comedian knows no boundaries.